Cal-Ranch Store has lost a loyal customer today, the classiest overall wearing, Whomper stopper kicking, Stetson hat styling, billfold with chain wearing lady has decided that we all aren’t fun anymore. She has headed to a better party in the sky hosted by her father Jesse Torrez Nevarez, Mother leonor Perez Nevarez and husband William Luther Sprague. Soyla Perez Nevarez Sprague was born in Soda Springs Idaho on May 20th, 1960. She delegates to continue this party, her twin sister Suzanna Nevarez -her younger twin (I was told to say that), brother Daniel Nevarez, sister Norma Nevarez, sister Sandra Cantu with husband Richard, sister Josie DeLaCruz with husband Ruben; twin brother Jesse Nevarez with wife Mary Ann, sister Sylvia Nevarez and baby sister Patricia Nevarez. Soyla had two beautiful children, one more beautiful than the other (I was told to say that) Melaine Rose Naranjo and Manuel Delgado. Soyla has five grandchildren: Hailey Nevarez, Demetries Delgado, Dominic Delgado, Jeremiah Naranjo and Ashleigh Naranjo and two great grandchildren Mariano Demetrio Garcia-Delgado and Willow Grace Delgado. There isn’t enough room to list everyone she considered a child or grandchild. Some say in her professional experience as a “collector of a lotta everything” all children she met were held as a collection in her heart. Although Soyla Sprague lived a less than typical life span there was nothing typical about her life. She was the black widow of the bar pool world, the Evil Knievel of her brothers’ motorcycles, the tallest 5 ft nothing chankla throwing champion, delegator of siblings, squisher of the babies, kisser of cheeks, you will ever meet, there was nothing she couldn’t do or overcome!! Soyla loved the outdoors, she would spend weeks out in the mountains with her husband Will and her fatso Hailey. She loved animals, arts and crafts and anything from nature (wink wink). 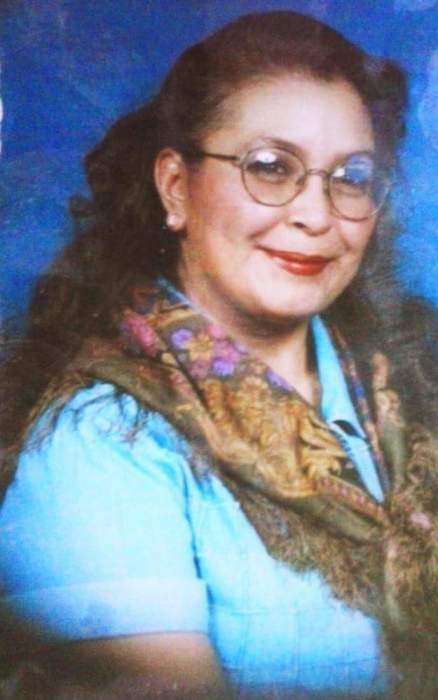 She was very skilled at making blankets, crochet, knitting, sewing, glass art, painting, jewelry making and cooking. Soyla loved her family and friends and took advantage of any opportunity to celebrate with them. She was the life of the party with her stories and her contagious laugh. Ahh her laugh…. It was like the call of a lost Dodo bird (I’m just kidding I have no idea what a Dodo bird sounds like, but I bet you are smiling as you remember her laugh) She had an energy that just drew people to her, Once at a concert she took the attention away form Rod Stewart, true story! Above all Soyla loved her Lord and savior Jesus Christ. She had a close relationship with him and called upon him every day in every moment . He alone made this little Taurus as tough as she is to be able to get though all that life threw at her. Life was far from easy, almost unfair for Soyla but you would never see her cry over it. So let us not cry for her but rejoice. Please join us for one last celebration as we pay tribute to the most unique person I have had the pleasure of calling my mother. Funeral services will be held at 11:00 a.m. on Friday, September 21, 2018 at the Burley 7th Ward Chapel of the Church of Jesus Christ of Latter-day Saints, 2200 Oakley Avenue in Burley. A viewing will be held from 10:00 to 10:45 a.m. prior to the funeral. Burial will take place at Gem Memorial Gardens immediately following the funeral service. Arrangements are under the care and direction of Morrison Payne Funeral Home in Burley.